Countless times in recent years I have set off down the vitamins and supplement aisle at my local store, and wondered why there can’t just be one product that contains everything I need. There are too many options for too many ailments, or potential ailments, or potential future ailments. You get the point. It is not uncommon for customers to shy away from that aisle because of sheer overwhelm. Not only does shopping for vitamins and supplements become overwhelming, it can also get extremely expensive. So when I learned about Wellpath Solutions custom vitamins and supplements, and their custom shake mix, I couldn’t wait to become an affiliate and share it with you. The folks at Wellpath Solutions were reading my mind, or maybe they just folks like me wondering aimlessly down the aisles. As someone who has had immense experience with the need for treating the individual body rather than a lump sum of similar people, I am all about a comprehensive solution with personalized care. After all, no two bodies are the same. We all want to put the right ingredients into our bodies, but that is typically easier said than done. Even those of us who focus on healthy living are deficient in some nutrient. Almost 90% of Americans are nutritionally deficient in some area of their diets, so we can’t afford to wander aimlessly and leave the store with nothing. Though there are brands of nutrients that I highly recommend, knowing what our bodies are missing can be a difficult proposition. It requires time and focus to sort through all the health information out there and determine what is needed for our personal goals and needs. 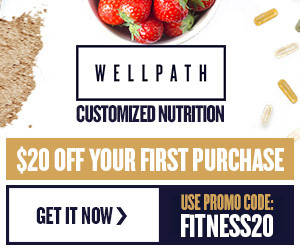 WellPath formulates custom vitamins and supplements with ingredients selected for you based on a detailed online consultation, and tailored to your specific goals and needs. They come in the form a one month supply of a shake mix and/or vitamins and nutrient supplements. The shake mix can be taken with water or mixed into shakes and smoothies of your preference. Both are meant to be taken daily. They obtain components from organic sources whenever possible, and actively try to select organic, non-GMO and pesticide-free ingredients. This sounds like a pretty great alternative to wandering aimlessly down the aisles of your local health food store, doesn’t it? For more information, go to https://www.gowellpath.com. Disclosure: The information shared here is meant to be entertaining and informative. You should always talk to a medical professional before making any changes to your routine or lifestyle, especially if you have a recurrent health issue. Affiliate links included. Got 15 Minutes? Then Try the Metabolic Aftershock Workout!